Now in its fourth consecutive year, Dorchester Collection Fashion Prize grand final will be hosted at The Dorchester on 29 October 2013. The judges are in the process of reviewing the applications following the 7 June deadline, and the five shortlisted candidates will be announced on 23 July. Supporting young talent and assisting aspiring fashion designers to take their brand to the next level, the Dorchester Collection Fashion Prize provides international recognition and an endowment of £25,000 to the most gifted designer of ready-to-wear fashion or premium accessories. This year, the Dorchester Collection Fashion Prize is expanding the competition internationally for the first time, accepting entries from designers who are based in all countries where Dorchester Collection properties are located: UK, France, Switzerland, Italy and USA. Dorchester Collection is delighted to announce the appointment of Irene Hoek as head of global development at Dorchester Collection. She will be responsible for identifying acquisition and management opportunities to grow the brand. With nine hotels, Dorchester Collection is planning to increase its luxury portfolio with several new properties in the pipeline in key cities by 2015, through acquisition and management agreements. Dorchester Collection' - an exclusive list of signature facials and body treatments hand-picked for the first time from some of the leading spas within Dorchester Collection's world-class hotels in Paris, Geneva and Los Angeles. Offering a rare, international adventure of spa excellence, luxury skin care brands include La Prairie from The Beverly Hills Hotel and Hotel Bel-Air, Valmont from Le Meurice in Paris and Shiseido from Le Richemond, Geneva. 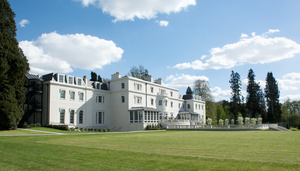 The Dorchester and Coworth Park have also contributed with signature treatments by British brands Kerstin Florian and Aromatherapy Associates. All seven 'Selected Spa Signatures from Dorchester Collection' can be purchased for £1,100 to be taken within one year or treatments can be purchased individually from £120. Wimbledon, the world's most famous tennis tournament, will be celebrated at The Promenade at The Dorchester with a special Wimbledon Afternoon Tea where guests will be able to enjoy tennis inspired cakes, pastries, and strawberries and cream with champagne. The Wimbledon Afternoon Tea is available from 22 June to 7 July and costs £55 per person. There are five sittings daily: 1.15pm, 2.30pm, 3.15pm, 4.45pm and 5.15pm. between now and 2015. The hotel lobby has recently been enhanced and the guest rooms and suites are next to be refreshed. loved dining destinations. The newly unveiled pool cabanas have also been upgraded in keeping with the overall design theme and the celebrated Cabana Café will be revealed on 24 June. This summer, The Beverly Hills Hotel will be adding a splash of fun to its unique poolside experiences with new 'pop-up' refreshments and added service enhancements, including sunglass cleaning, ice cream sundaes and sorbet which will be offered on a complimentary basis throughout the day. Therapists from the hotel's La Prairie Spa will also be on-hand to offer reflexology foot massages, priced at $45 (about £29) for 15 minutes and $85 (about £55) for 30 minutes, also available at Hotel Bel-Air. To celebrate being in the heart of the LA action and under the Californian sun, The Beverly Hills Hotel is offering a 'California Cruisin' package whereby an array of sought after automobiles will be readily available for guests to enjoy cruising around Los Angeles. The various cars will include a C-Class Mercedes, E350 Mercedes Sedan, Range Rover and a Ferrari. Priced from $880 (about £548) per night including car rental and nightly valet parking, reservations must be booked three days in advance with a minimum stay of two nights. 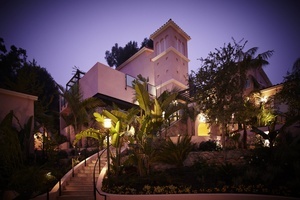 The 'California Cruisin' package is also available from $680 (about £423) at Hotel Bel-Air. Le Meurice is celebrating the summer with a variety of new banqueting offers. These include a private wine tasting with head sommelier Estelle Touzet followed by a dinner in one of the banqueting rooms; a cocktail materclass with bar director William Oliveri; The Grand Siècle Dinner, which looks back at the past century with traditional French service and cuisine; and a Rossini Dinner combining Rossini's music and recipes. Rates are available upon request. The 2013 Meurice Prize for Contemporary Art has launched at Le Meurice with a high profile panel of international judges from the world of art, including the winner of last year's prize, Alexandre Singh, and Franka Holtmann, general manager of Hotel Le Meurice. Created in 2008, the Prize for Contemporary Art has a €20,000 endowment and aims to nurture up-and-coming talent in order to support them on an ever-competitive international stage. The six finalists who have been selected to take part in the grand final are Bertille Bak and Galerie Xippas; Neil Beloufa and Galerie Balice & Hertling; Jonathan Binet and Galerie Gaudel de Stampa; Chloé Maillet and Louise Hervé from Galerie Marcelle lix; Elsa Sahal and Galerie Claudine Papillon; and Ulla Von Brandenburg from Galerie Art: Concept. The final will take place at Le Meurice on 7 October 2013. Hôtel Plaza Athénée is celebrating its centenary this year with a variety of special offers and a partnership with the Théâtre des Champs-Elysées. The hotel is offering a 'Rite of Spring' package with the Théâtre des Champs-Elysées, also celebrating its centennial year and which hosted 'The Rite of Spring's first performance 100 years ago. In celebration of this triple centenary, the 'Rite of Spring' package will include a night's stay at the hotel, two box tickets for one of the six various performances of 'The Rite of Spring' with a glass of champagne in a private lounge during the interval, and a special dinner for two at Le Relais Plaza. The promotion is available on the performance nights in June and July with rates from €2,900 (£2,464) for a Junior Suite Deluxe and from €3,365 (£2,859) for a Superior Suite. 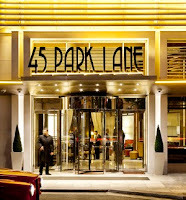 on reservations.HPA@dorchestercollection.com or call (+33) 1 5367 6667. Just in time for the summer, La Terrazzina at Hôtel Plaza Athénée is now open for guests to enjoy a taste of Italy with an alfresco-dining experience on avenue Montaigne, one of the most famous fashion avenues. Between 8pm and 11pm every day, chefs Frederic Larquemin and Mathieu Emeraud will prepare the finest dishes in Italian cuisine and offer a selection of pastries which they have created especially for the hotel's centenary. La Terrazzina is open every evening until 16 September and the menu costs €70 (£59). For reservations please contact terrazinadelplaza@plaza-athenee-paris.com or call (+33)1 53 67 66 00. This summer, celebrated chef Alain Ducasse teamed up with Tom Kitchin, executive chef at The Kitchin restaurant in Edinburgh. On his numerous travels, Ducasse meets other chefs who share his vision of cooking; focussing on the quality and flavour of natural produce. In order to celebrate these talented chefs, he launched "Les Rencontres Essentielles" (Essential Partnerships) in 2012. For this fifth collaboration, Tom Kitchin hosted a lunch as Ducasse's special guest at Hôtel Plaza Athénée on 18 June.